Home Tennessee Takeover Entry Upcoming Concerts Current Events Guest List Party Packages FAQ Contact Us! HomeTennessee Takeover EntryUpcoming ConcertsCurrent EventsGuest ListParty PackagesFAQContact Us! Real Country, Real Cowboys, Real Good Times. Join CISN Country May 9th to the 12th for three incredible nights in Nashville , Tennessee! 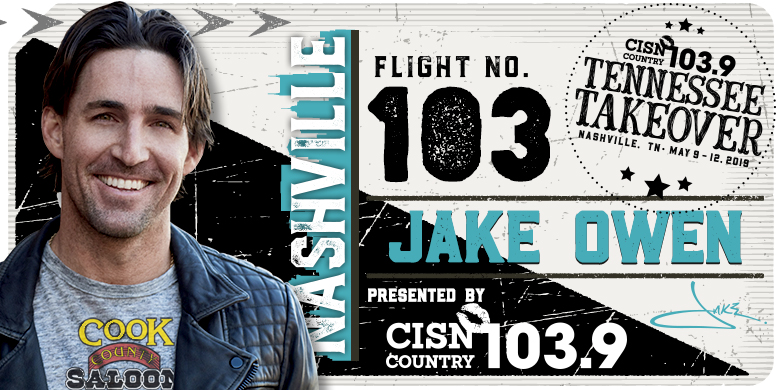 You and a guest will fly nonstop to Nashville on Flight 103, a private plane filled with CISN Country Listeners, and stay in luxury accommodations right in the heart of all the action. Then, we’re giving you a once in a lifetime private concert experience with ACM and ACA award winning superstar, JAKE OWEN and special guest MacKenzie Porter! ENTERING IS OFFIcially closed. our finalists have been contacted via email. Final Draw is April 18 at Cook County Saloon. NO PURCHASE NECESSARY. LIMIT ONE (1) ENTRY PER PERSON PER CONTEST PERIOD. APPROXIMATELY 40 FINALISTS TO BE CHOSEN. APPROXIMATE RETAIL VALUE OF EACH PRIZE CDN$3600.00. MUST BE A LEGAL RESIDENT OF THE PROVINCE OF AB WHO IS AGE OF 21 OR OLDER AT TIME OF DRAW. CONTEST RUNS FROM MARCH 22, 2019 TO APRIL 12, 2019. ODDS OF BEING SELECTED DEPEND ON NUMBER OF ELIGIBLE ENTRIES RECEIVED.